We woke up pretty early for this day since we were planning to take a bus from Quebec City to Montreal. If you’re taking ground public transportation, you can either take bus (Orleans Express) or train (Via Rail). Both options have similar price. We spent $56.80 for the bus ticket per person, but if you are student, you can get a discount (I think my brother’s ticket was $10 cheaper than mine). Most Orleans Express’ buses have FREE Wi-Fi in the bus; however, when we were on the bus, we could only check the email – NOT opening websites. 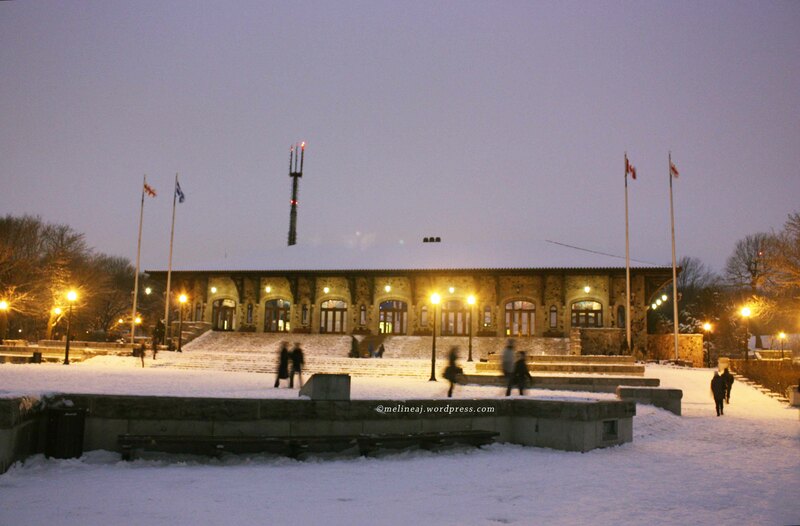 From our hotel, we took a taxi to Gare du Palais, the bus and train terminal located in Old Quebec. It was about $15-20 ride. We didn’t book the ticket in advance since we were thinking that not much people would travel during this holiday time. PLUS when we checked the Orleans Express website, we found out that the bus going to Montreal was pretty much available every hour. The trip from Quebec City to Montreal took about 3 hours. God blessed me because I slept like a baby throughout the trip and I was surprised when our bus passed through a bridge overlooking La Ronde which told me that we were already in Montreal! (La Ronde is an amusement park in Montreal, but it only opens during summer. It has some very extreme rides from what I saw from the bus ~ definitely NOT for me! hahaha…). 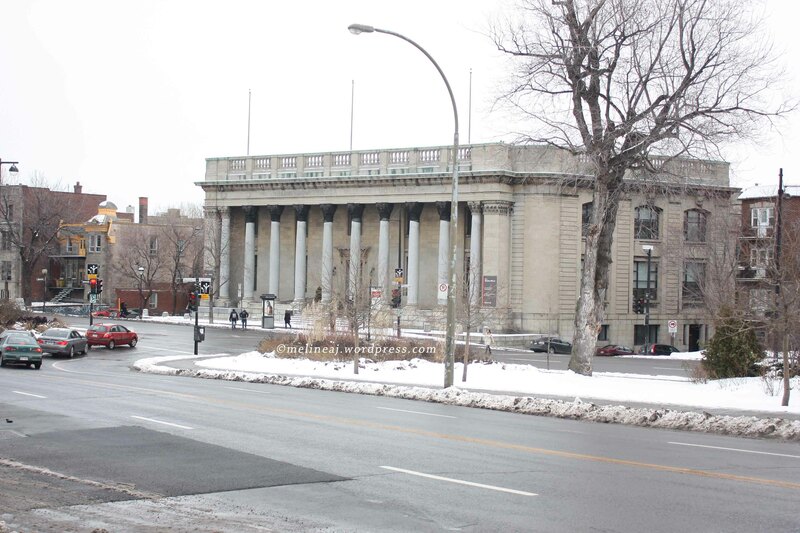 The bus stopped at Gare d’Autocars de Montreal (1717 Rue Berri). This was only a block from Station Berri-UQAM, the central subway station in Montreal. We had some difficulties carrying our luggage from the bus station to the subway since it didn’t have elevator nearby. So yeah, I relied on the strength of my 2 favorite boys 😛 Luckily, there was an underground passage that connects the two stations since it was pouring snow outside! From my research earlier, it’s more beneficial for us to buy a 3-days passes for the Metro (subway) since it can be used in subway and bus unlimitedly! And it was only $16!!! Plus, if it can be used for 747 Express Bus going from certain downtown areas to the airport. 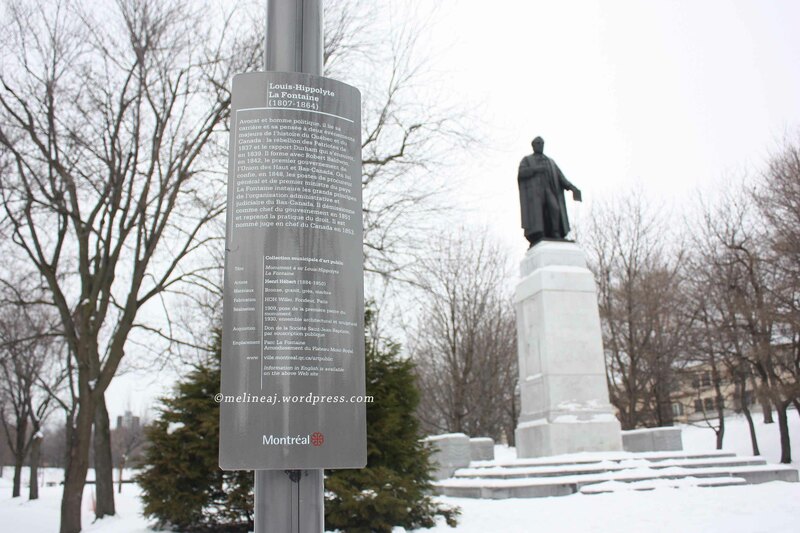 If you want some information about Montreal metro system, click to its website. And here’s the map of the subway. We took the green line to Station Peel that was just couple blocks away from our hotel, Le Cantile Suites. Luckily, we were able to check in early. The hotel was an old building and decor inside the room and the bathroom was a bit aged. Since we only stayed there for a night, it was okay for us. It was about lunch time and we were super hungry. So, we decided to go to Schwartz’s! Why did we go there?! Because it was SUPER AWESOME! As our ritual before traveling, my fiance tried to look for any travel channel programs that covered the place that we were about to go – so, in this case was Montreal. 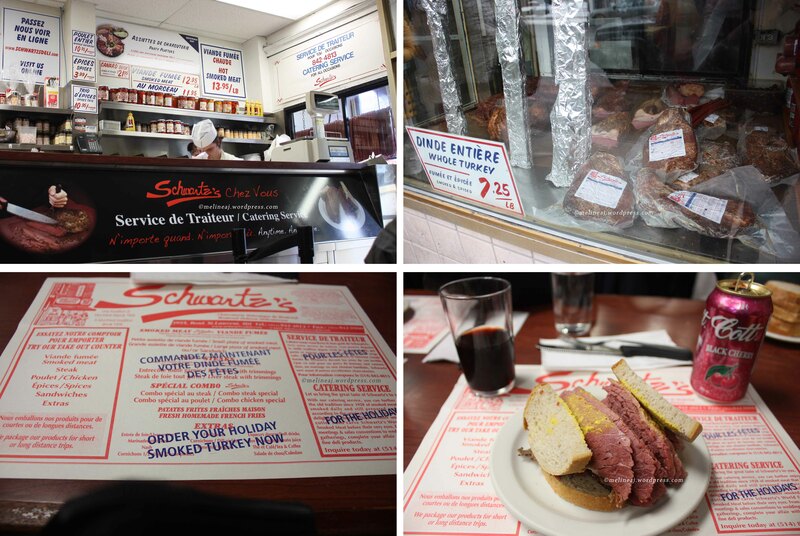 We saw Andrew Zimmern, Anthony Bourdain, Rachel Ray; pretty much every celebrity chef had been to Schwartz’s. Also, when I googled what’s the popular restaurant in Montreal, Schwartz’s always came up at the first place. And, all of the above were TRUE! -This is where data plan on iPad became VERY handy! We had no wi-fi connection in our hotel room and I was too tired to think how to get to the restaurant. Google map helped us to find the bus #144 and the direction to where we should walk. It was about 20 minutes ride + 10 minutes walk from our hotel to the restaurant). Look at those smoked meat…. NYUM! ; Yep! That’s the line up! 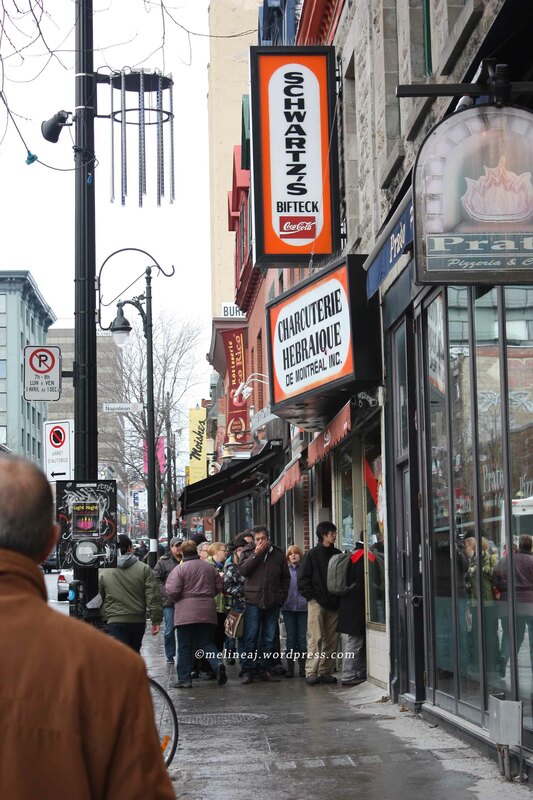 There are lots of restaurant and shops along Saint-Laurent Boulevard. After 5 minutes walk, I saw a chic cafe called Juliette & Chocolat. Seeing the word ‘chocolate,’ I forced the boys to enter the cafe hahaha…. This cafe has several locations throughout Montreal, so check out their website to find the nearest location. They serve sweet and savory crepes, hot and cold chocolate beverage, alcoholic chocolate, fondue, ice cream bowls, brownies, and other things. Since I was craving for a crepe, I ordered a simple Ice Cream and Melted Chocolate Crepe. My brother ordered Snow White – an alcoholic beverage with white chocolate and Bailey. The crepe was big and super good! And they were generous in giving lots and lots of chocolate! The drink was good too – if you like sweet drink. Full but tired, my brain felt like it was frozen. I couldn’t think where should we go, so my fiance took charge and decided to go to another Montreal favourite restaurant, La Banquise. 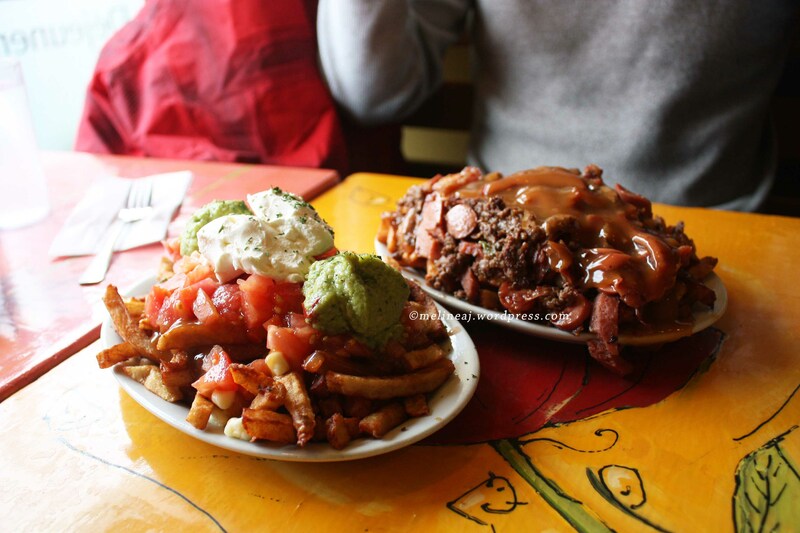 La Banquise serves various toppings for poutines, the classic Montreal dish. PLUS, they open 24 hours and their price was pretty cheap considering a huge portion of the meal. Although I was a bit reluctant to eat again – I was still stuffed! – I just followed the boys who were seemed still hungry. Again, we relied on Google map and iPad to find bus #24 that took us to La Banquise. It was about 20 minutes ride. 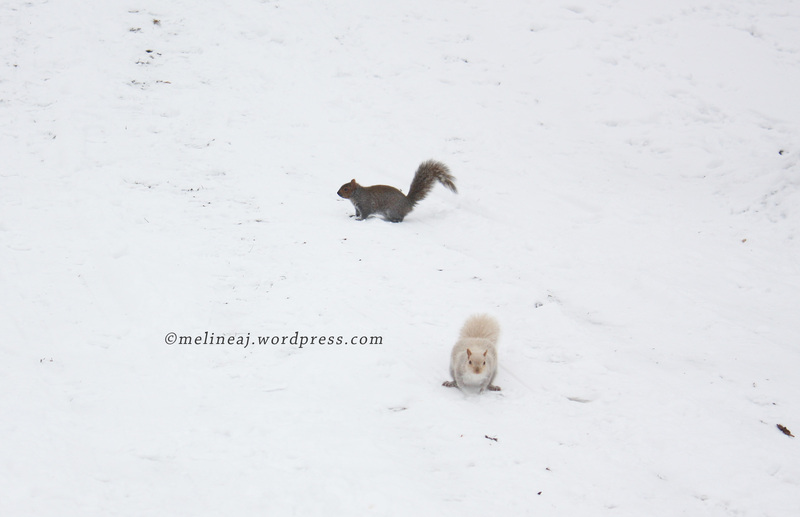 The two squirrels who cashed us! We were super full! 3 meals within 3 hours! So, we agreed to check out Parc du Mont Royal. This park is a huge hill in the middle of Montreal downtown area. It has several attraction spots – similar to Stanley Park in Vancouver. We took bus #11 from La Banquise to the park and it took about 35-40 minutes. It was a perfect timing when we got there. It was still bright so we could take pictures of the Winter Wonderland! The view of Montreal downtown from the Kondiaronk Lookout was really stunning! Near the lookout, there is a Chalet that was used as a station for snowshoers. The walk seemed fun since everything was covered with snow. Plus there were a lot of young families with small children that looked super cute bundling up inside their puffy jackets. A lot of older people also enjoyed walking around the park although the snow was pretty thick. We also walked toward Mount Royal Cross but stopped halfway since we only wanted to take pictures. We then walked back toward the Lookout and it was already dark! But the city lights made the downtown so pretty! With a better mood, I suggested we booked the ticket for Cirque du Soleil, Dralion, since we saw the advertisement earlier in the subway station. This was my 3rd time watching Cirque du Soleil and from what I saw in the trailer, the show promised to deliver pretty amazing tricks. So, we headed to Bell Centre. In fact, when we got there, it was just about an hour before the show begin and luckily, there were still some tickets left. At the end, we watched the show at that day since we were pretty tired to walk around. The show was pretty amazing. When we walked back to the hotel, it was raining hard and we didn’t bring our umbrella. Oh well, at least we slept pretty tight that night. P.S. when we took city bus, we never waited long for a bus. Later, I noticed a poster in a bus stop saying that they guarantee that buses will come within 10 minutes. AWESOME! Considering how cold Montreal can be during winter! P.S.S. I love Montreal’s architectures! The houses are super cute with rustic style. The funny thing that my fiance noticed was stairs are all in front of the house. Later, he googled the reason for the front stairs is used to conserve the space inside the house – since space is very limited – and can be used to share property tax (if the house has 2 levels, the upper and lower occupants will share the property tax).